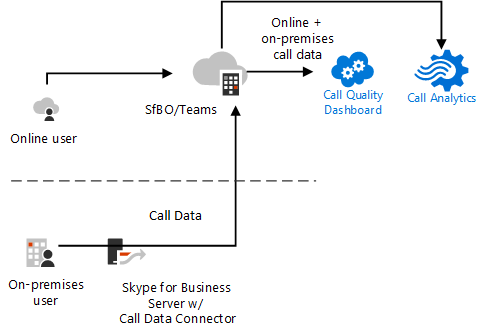 This topic describes benefits, planning considerations, and requirements for implementing Skype for Business Server Call Data Connector. For more information on configuring Call Data Connector, see Configure Call Data Connector. At public preview release, only Call Analytics dashboard is available. View and troubleshoot problems across your network. The server pushes both Quality of Experience (QoE) and Call Detail Recording (CDR) data to the online service. Call Analytics focuses on quality problems with specific calls. It shows detailed information about calls and meetings for each user in a Skype for Business account. 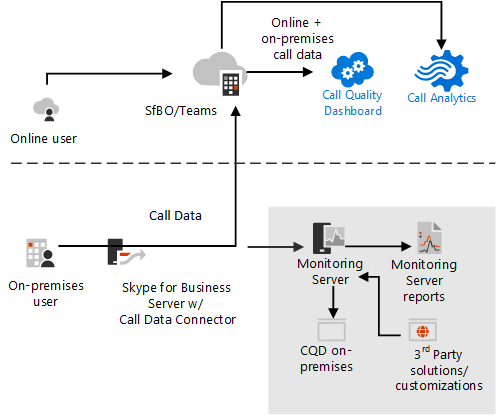 With Call Analytics, you can assign permissions to a helpdesk operator who can then monitor calls without having access to the rest of the Skype for Business Admin center. Call Quality Dashboard focuses on network performance and issues across an organization. Skype for Business administrators and network engineers use this tool to troubleshoot and optimize network performance. For more information, see Call Analytics and Call Quality Dashboard. Enable Hybrid connectivity. If you already have Skype for Business Server deployed and you want to enable Call Data Connector, you must ensure that you have hybrid connectivity set up between your on-premises and online environments. This is sometimes called a split domain configuration. For more information, see Plan hybrid connectivity between Skype for Business Server and Office 365 and Configure hybrid connectivity between Skype for Business Server and Office 365. If you have not already done so, turn on Call Quality Dashboard as described in Turning on and using Call Quality Dashboard for Microsoft Teams and Skype for Business Online. Enable the front end pool for Monitoring, with local LCSCdr and QoEMetrics databases. Without this, Call Data Connector won't have metrics data to work with. Call Data Connector will not function if Monitoring is not enabled on the front end pool.